Where Is Botrytis in Your Growth Operations? Botrytis is one of the most common plant pests affecting greenhouses, nurseries, landscapes and food operations. The fungal pathogen causes grey mold and blight. 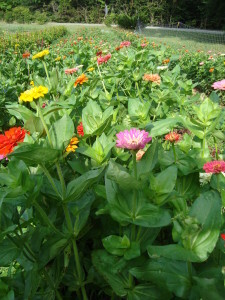 It can attack and blight buds, flowers, fruit, leaves, and stems. Plant disease severity rating scale. Why is Botrytis developing, despite having clean plants and growing spaces? Plants become susceptible to disease when stressed, excess free water on stems and leaves, reduced air circulation and a susceptible cultivar. Taking measures to improve propagation and shipping methods will reduce incidents within your operations. 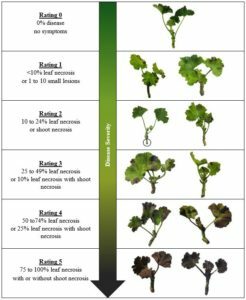 PhD student Nathan Jahnke and Dr. John Dole reported on recent research with the occurrence of Botrytis in geranium cuttings during shipping in an article that appeared in GrowerTalks (April 2018). This research within the Cut Flower and Postharvest Floriculture Program is an example of the group addressing one of the floriculture industry’s major concerns. • Thursday Morning Update...rains Moving in Today!